There is a great crowd at the aerodrome to see us on our way, and the Altair stands ready outside the hangar, sitting well down in the shock absorbers with 470 gallons of fuel on board. P.G. Taylor so describes their departure from Hawaii in his book Pacific Flight. 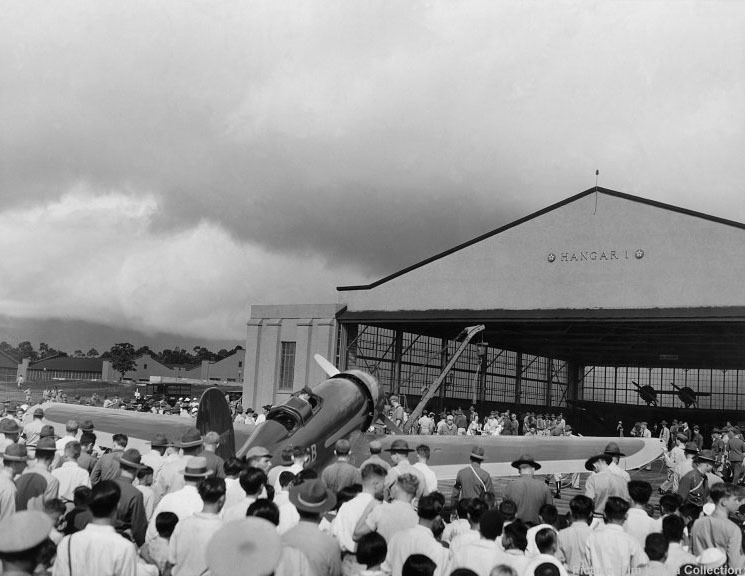 The caption on the reverse of this photo states that the aircraft has just arrived in Hawaii but the date, 3 November 1934, suggests that the aeroplane is actually being prepared for departure to Oakland. Note the Douglas Dolphin amphibian at the back of the hangar. Picture: Wide World Photos, Los Angeles Bureau via Tim Kalina Collection.